Hi friends...Welcome to AYESHA'S KITCHEN. 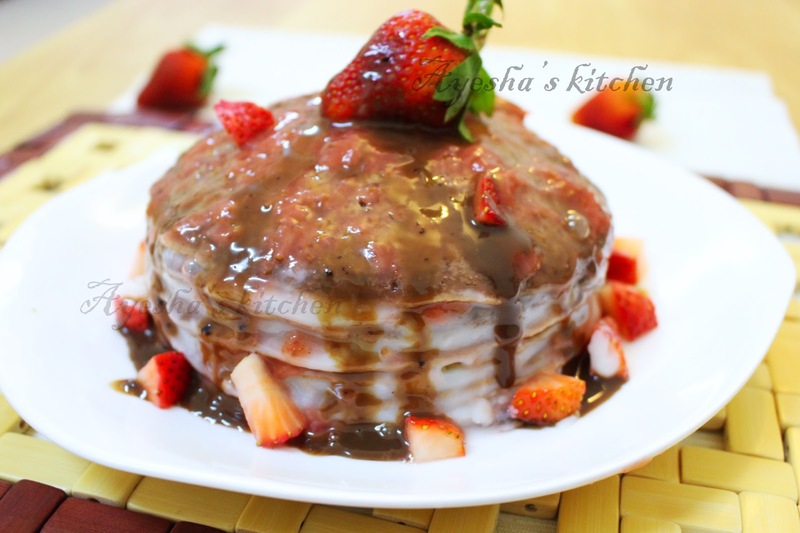 Here is a chocolate pancakes cake recipe topped with strawberry sauce. How about a sweet chocolate pancake with a nice cup of coffee? And, if it is pancakes cake..its worth yummy, right? 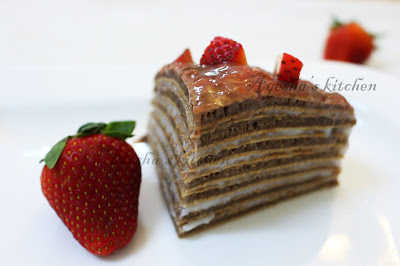 The concept of pancake cake is really an outstanding one as it is less time consuming than the ordinary cakes. Moreover people loves to make more creamy layers with less effort. Try this no fail pancake mix . You don't even need an oven for this special flat, thin , round layered cake. So let me share my recipe of chocolate cream pancake with strawberry topping. 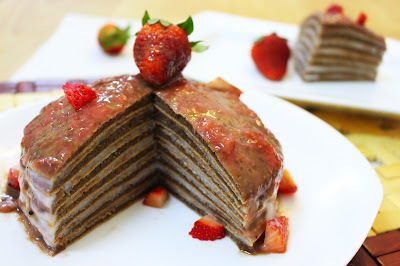 Do try this simple pancake cake recipe / pancake breakfast /yummy pancakes /pancake ideas / cake made with pancake mix. Chill the glass bowl and beater blades for about 1 hour. Whip the chilled whipping cream in this glass bowl until creamy. Add powdered sugar and vanilla essence and again whip until smooth. Next is to prepare the pancake batter. Beat the egg , milk and powdered sugar very well . Combine together all purpose flour , baking powder,salt and coco powder in another bowl . Add this to the prepared egg batter and whisk it till the flour mixture is completely added. Add vanilla essence and oil to this and mix well. The consistency must be like melted ice cream. Heat a non stick pan on medium high heat. Do not overheat the pan and do not grease the pan. Pour a ladle full into the pan and swirl slowly .Cook for few seconds and just flip it and cook the other side . Make 8 - 10 pancakes and set aside. The next step is the preparation of strawberry syrup. For that cook chopped strawberries, sugar and 5 tbsp water in a vessel until you get a thick syrup. Spread the cream on each layer of the pancake and finally pour the syrup over the pancakes. Garnish with chocolate sauce or strawberry.